AudioWipes are considered to be the audiologist's choice audio wipes! 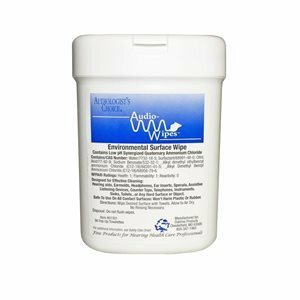 These wipes contain a hospital grade disinfectant that helps clean, deodorize, and disinfect your custom-made ear pieces such as hearing aids, ear molds, and swim plugs. ⦁	36 pop-up towelettes; for larger canister of 160 wipes. ⦁	Wipe dimension: 4.5" x 3.5"